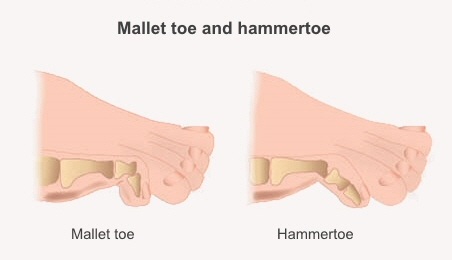 Mallet toe is like hammertoe, but it affects different joints. If you have mallet toe, then one or more of your toes bends down abnormally from the joint closest to the tip of your toe. In hammertoe the bend happens at the middle toe joint. Mallet toe can affect your big toe, second, third or fourth toe. It can be painful and disabling. nerve or muscle damage that affects the way your foot works. Your risk of getting mallet toe increases as you get older. It's more common in women than in men, and having a second toe that is longer than your big toe may also increase your risk. a toe that's stuck in a bent position. If you can still straighten your toe, it's called flexible mallet toe. If you can't move it at all it's called fixed mallet toe. Pressure on the top of the toe joint can cause irritation. You may develop a corn on the top of your toe, and callus on the bottom. Corns and calluses can become painful and cause extra symptoms, such as redness, bleeding, and difficulty wearing socks and shoes. How do I avoid getting mallet toe? Limit how often you wear high heels, and do stretches and exercises such as picking up objects with your toes to keep them flexible. When you're buying shoes for children, make sure they are fitted properly, especially at times when the children are growing rapidly. stretch your foot daily to strengthen the muscles. How is a mallet toe treated? As long as mallet toe isn't painful or changing the way you walk, it doesn't need to be treated. Treatment focuses on relieving the pressure under the tip of your toe. You may need special footwear that has extra depth around the toe to alleviate this pressure. Seeing a podiatrist for orthotics or toe protectors can often help. If the joint is still mobile (and not fixed), physiotherapy can also help. You can find a podiatrist by searching on the Podiatry New Zealand website. You can find a physiotherapist by searching on the Physiotherapy New Zealand website. Occasionally, if podiatry and physiotherapy have not improved your pain, you may need surgery. This is unlikely to be covered by the public health system, but you may ask your GP to refer you to a private orthopaedic surgeon. If your mallet toe happens after an injury, this might be treated with a plaster. See your health professional to check if you need any treatment. Written by HealthInfo clinical advisers. Endorsed by podiatry liaison, Canterbury DHB. Page created April 2017.